This is another card I made during the DTGD challenge week. The challenge for this one was to add stitching to a project, so I used my heart Framelits and stitched on two of the hearts with metallic needlepoint floss. Aside from the stitching which takes a bit of time, the rest of the card was pretty straightforward and I think the beautiful papers and flower trim did most of the work. I'm happy with the elegant result. This card was inspired by a sample I saw online on Pinterest. I reproduced it using the stamps I had on hand. It could work as a Valentine card, but I was thinking wedding card when I put it together. I really like the look of kraft and gold paired together. A little bit elegant, a little bit rustic. To keep in with that theme and have the background less stark, I used the retired spritzer tool with a Soft Suede Stampin' Write Marker to add speckles to the background. If you don't have the spritzer, I suggest using the speckles image from the Gorgeous Grunge stamp set instead, for a very similar result. 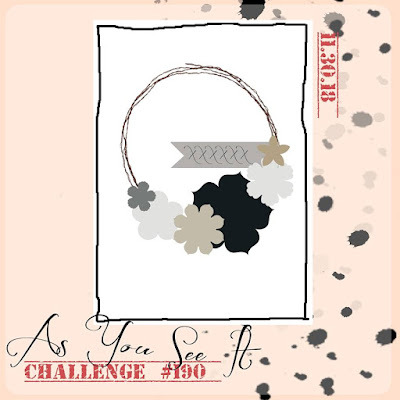 When I saw the As You See It challenge #056, I knew it was the kind of design that leaves a lot of room for creative interpretation. I chose to be more traditional in my interpretation of the sketch in order to use paper scraps. Another old set I had stumbled unto when looking through my stamps was Big Celebrations and I decided to use the wedding image because I don't have a lot of wedding-theme cards on hand. I had also noticed when last using the Label Love stamp set (Annual Catalogue, p. 14) that I had never used the newlyweds sentiment yet. I embossed it with Silver Stampin' Emboss Powder on Silver Metallic Paper. The main image was embossed in black powder and decorated with rhinestones, Dazzling Details and I colored the plate using the Silver Stampin' Dazzle Marker. The cute white button is from the Nordic Designer Buttons pack, found in the Holidays catalogue, threaded with black needlepoint floss. Frosted sequins from the Holidays catalogue were also scattered on the card for added pizzazz. I've been drawing inspiration from the Dare to Get Dirty 2014 challenges posted on Splitcoast Stampers to get inspired to stamp this week. This is one of the card that was born out of combining a few different challenges. I really like this color combo, it feels very fresh and summery to me. As I was choosing a sentiment for my design, I decided it would be a good idea to have an extra wedding card on hand, since I don't have a whole lot of those. I picked the beautiful two-steps Stippled Blossoms stamp set as my main images. To create the card background, I stamped the Hardwood background stamp on Smoky Slate cardstock using Basic Grey ink and then sponged some Basic Grey ink on the design to enhance the weathered wood look. I then used the new Dots & Stripes masks sold by SU! to spritz dots over the wood pattern using Silver Smooch Spray (now retired). This is definitely different from the wedding cards I would have usually put together, but that'd the beauty of playing in online challenges, pushing yourself to do different things and step out of your regular patterns. I wanted to create a frame for my bride, so I used the Framelits die and a window sheet to create the frame, along with Silver paper. The little roses are made out of white felt. I had a vision of how I wanted the little roses to look and really struggled before I managed to get them the way I wanted and even now, I'm unsure about the results, but at one point, I had to just let it be and move on. The sentiment comes from an hostess set from last year's catalogue called Banner Greetings. I added a pair of hearts punched with the Itty Bitty Accents Punch Pack, out of Silver paper and Dazzling Diamonds Glimmer Paper. The bottom layer that sits directly on the card base is a piece of vellum I found in my scrap pile, that reads "One Love," so it was perfect to go on this card. I made a matching envelope out of Designer Series Paper from the Neutrals paper stack using the Envelope Punch Board, then used the Label Collection Framelits dies to add a place for the address on it. I used the matching piercing template and my paper piercer to frame the die-cut, and a little silver heart on top to tie in with the card. 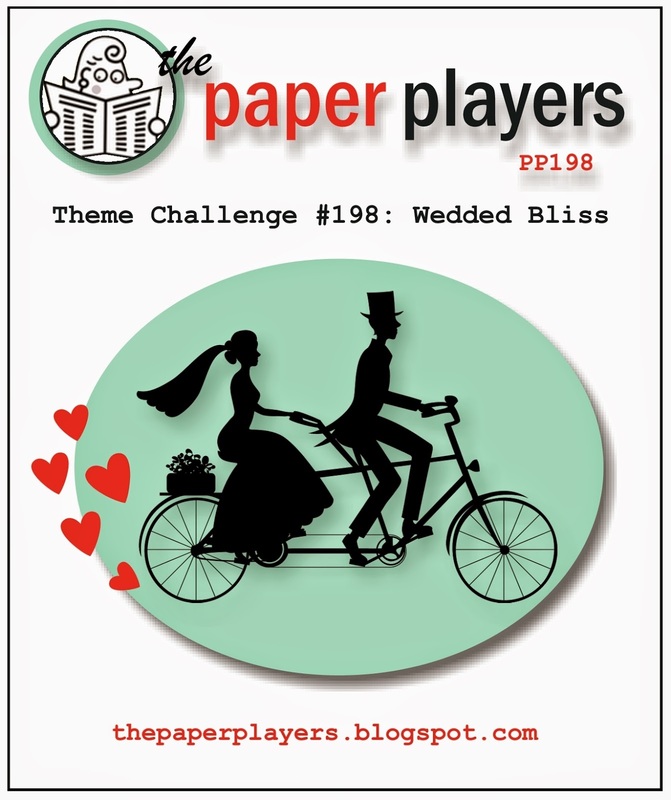 One of the online challenges this week (from Paper Players, challenge #198) was to create a wedding project, which was great timing since the Love & Laughter set is retiring and I wanted to create a last-minute something with it. I paired it with the Afternoon Picnic Designer Series Papers and the Natural Composition Specialty Designer Series Papers (which are both retiring). The dress was stamped in Wisteria Wonder ink and embossed with Iridescent Ice embossing powder. I added a flower punched with the Itty Bitty Punch Pack and dotted the center with a pearl. The bottom of the dress was trimmed with Victoria Lace Trim. This year, Stampin' Up! offered two special Valentines stamp sets offered for a limited time. They were cute, so I jumped on the chance to add them to my collection and I am afraid to admit that they hadn't seen ink until this week! Dreadful, I know! 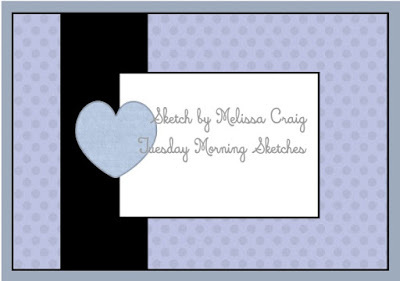 Today's set was perfect to use with the cute Mojo Monday Sketch (#332), so my card features the Follow My Heart stamp set. The clear-mount version is already sold out, but the wood-mount is still available (item 134611, CAD $19.95) if you are interested. Just send me an e-mail and I'll make sure to order it for you. I created my own tag out of Whisper White cardstock and stamped the Eiffel tower in Coastal Cabana ink. I used the same ink to add the sentiment on the Soft Sky strip. Since Valentines' Day is almost here, I decided to create a card that would be more useful for the upcoming months and stamped "congratulations," as I think this could make a great wedding card. The hearts were created with the Hearts a Flutter stamp set and the matching Framelits dies. The big heart was embossed with white powder on vellum cardstock and the small heart was embossed with white powder on Real Red cardstock, then they were layered on the card using Stampin' Dimensionals. TIP: Adhesive shows up under vellum, so the best way to adhere it, whenever possible, is to apply the glue underneath something that will be hiding it. In this case, I glued the red heart in place over the vellum heart, flipped the vellum over and applied glue underneath the red heart, where it would be hidden. The vellum cardstock we carry is thicker than vellum paper and so it will hold in place even though I have not put glue everywhere. The top of the tag was stamped with an image also from the Follow My Heart stamp set, in Real Red ink, and a piece of Natural Chevron ribbon (from the Occasions catalogue) was folded in half at the top. The adorable pattern paper is from the Fresh Prints paper stack. It's well hidden on page 33 of the Occasions catalogue, but you should check it out because it's beautiful and have a variety of patterns that will work well for many occasions. I cut my piece of paper to size and add a leftover strip that was the perfect width to do my middle band, so I simply flipped it over and used the reverse side of the first piece. I then added a piece of gold sequin trim (another item I LOVE from the Occasions catalogue - it adds a little of shine and flair to my projects) at the top of the paper band. Still working on getting all my stamps inked. I didn't have any wedding card on hand anymore so I used this Uptown Girl image to create one. I used the washi tape from the Watercolor Wonder pack to create my borders. The main image was stamped and embossed with gold powder on watercolor paper, then watercolored with inks and an Aquapainter brush. The sentiment comes from a retired hostess set called Notes de saison. I needed a wedding card in a pinch so I found this wedding tag I had previously and simply finished it off as a card. You can find the original post about the tag HERE. I used matching Modern Medley Designer paper and a piece of Very Vanilla cardstock embossed with the Perfect Polka Dot embossing folder for the back. A piece of Basic Black lace and pearls finished the look. Today's card was created because I needed a wedding card for someone at the office. I was looking for inspiration, so I turned to my pins on Pinterest and found a beautiful flowery card by Paula Dobson. I drew inspiration from her design and colours, but swapped the stamps and embellishments. The hearts come from the Hearts a Flutter stamp set. They were embossed in gold powder on a Very Vanilla card base and I added Crumb Cake ink with a sponge. The bottom corners were punched with a Corner Rounder punch. The sentiment (from a retired hostess set called Notes de saison) was stamped in Soft Suede and I added a sparkly heart punched out of Champagne glimmer paper (with the Owl punch). I also stamped a heart over the sentiment and embossed it with clear powder. I like this added touch - subtle but elegant! A border of Champagne glimmer paper was punched with the Scallop Border punch and I added a piece of Victoria lace trim and some Early Espresso narrow grosgrain on top. Pearls were added to three of the hearts as well.